“Euploeini butterflies flap their purple wings, across the mountain and valley back north to their breeding ground, highway will be shut for their travel route" says the guide we encountered in the park. "Every March, you will see a cluster of butterflies, like massive dark clouds moving fast across your head, that’s impressive"
We have been traveled to mountain area by little scooter couples of time, riding scooter into the mountain were safe, just sometimes roads were a little bit jolted. However this is a journey into Maolin, a place encountered serious typhoon every few years, the communication is disrupted once big typhoon come, we only have info that the road is a little graveled in the upper area near the aboriginal tribe. 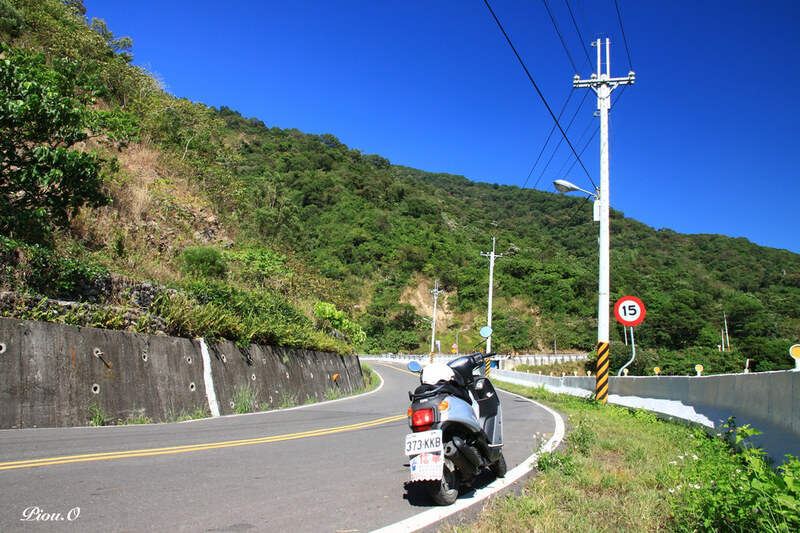 But our one hour journey seemed to be quite smooth, the road was already paved nice, the sky were cerulean, with an open view to the great mountain, we enjoyed the wind washed our face while riding up the mountain road. I always choose scooter as a way of traveling, scooter gives a more flexible travel, once we find good scenery, we can easily stop at any big corner and take a rest. And it’s better way to get rid of barking black dogs once you burst into some private area incautiously. 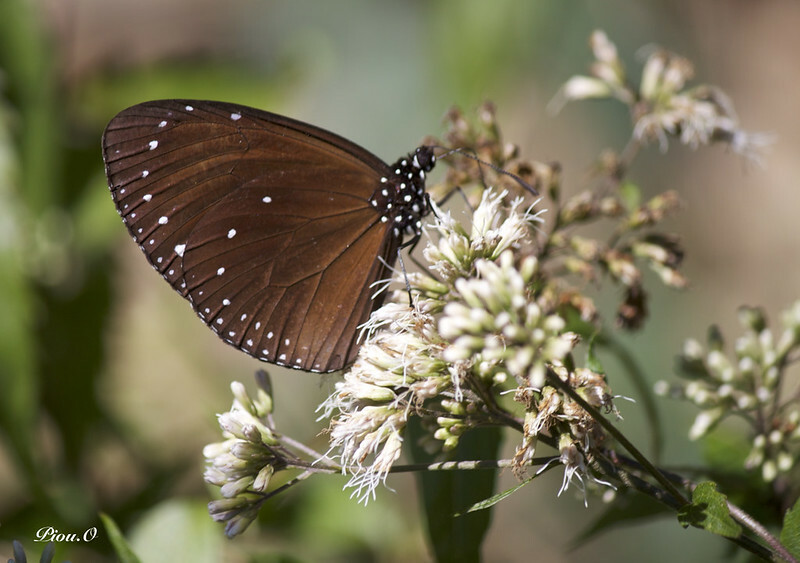 There are around 20Purple Butterfly Valley in southern Taiwan, and seven are in Moalin, we were worried we might miss their place and get lost in the deep mountains, but those purple creature will easily catch your eyes and lead you to the right place, they gathered around the nectar plants, lifting, fluttering and drinking. Seeing so many wild butterflies is quite normal in mountain area in Taiwan, but with this beautiful colored wings, not so many. We joined with other people, pointing our lens at the wings, chasing when they flutter to another flower, trying to get the best scene. After getting tired of bending down, we stretched out our body, and stepped on the stairs up to see if there were more. A group of retired-look people gathered in a small area, holding pens and notebooks, circling a man. The man stood in front of a board with four kinds of butterflies on it “Purple Butterfly Valley is one of the two wintering sites in the world." “What is the other one?" A woman asked. “Monarch butterfly’s home in Mexico, Purple Butterfly Valley in Taiwan and Monarch butterfly in Mexico will migrate to warmer place for winter and will fly back north to their breeding ground during spring." That’s strange though, do butterflies live such long life? at least five months for them to travel. 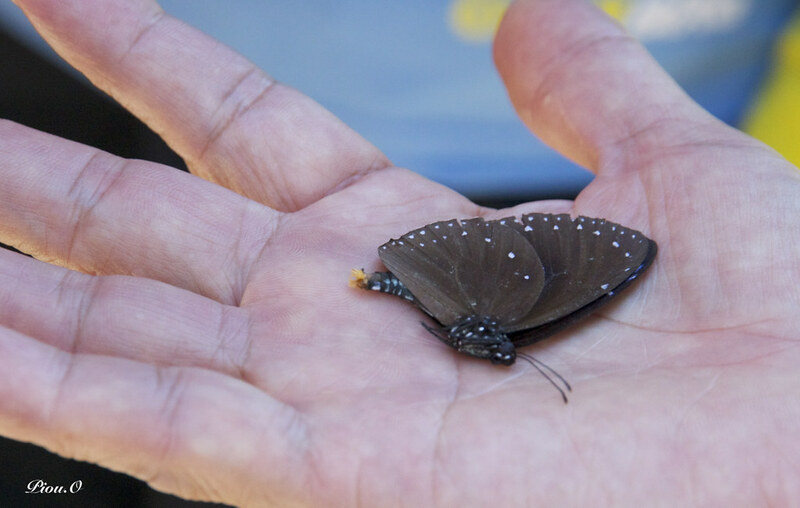 I checked on the internet, it says the longest life of butterfly known for 7 months. Wow, beauty lasts long. “The purple color only reflect at a certain angle." The guide man showed us how the magical purple reflects, which is really amazing. What is fun about a trip is you never know what’s new you will see. 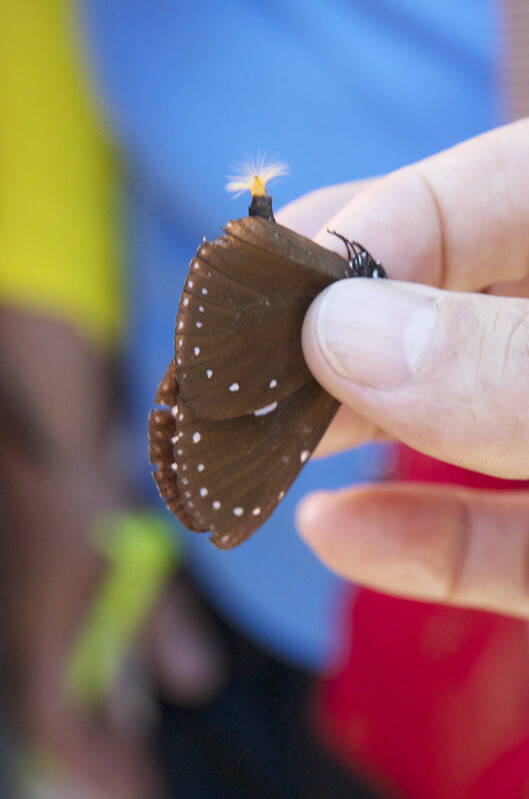 The guide pointed at the abdomen of the butterfly. 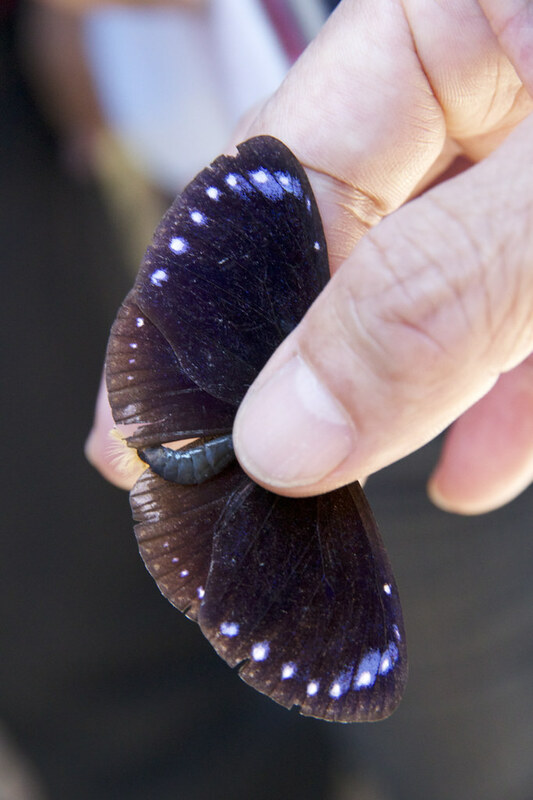 “The male purple butterfly posses extrusible brushlike structures, called hair-pencils. During courtship, males present their hair-pencil in their posterior abdomen, and disseminate pheromone." But this one doesn’t seem to seduce us. 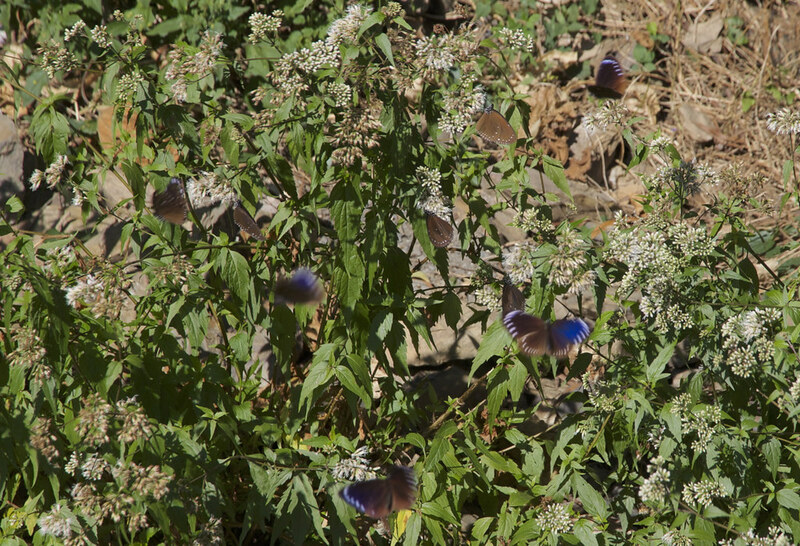 The guide continued"Purple butterflies also present their hair-pencil once there’s predator." This sounds more reasonable. “Hair-pencil is not their own trick to scare the predator, they will also play dead to cheat the enemy" Releasing the hand, the butterfly became so stiff, lying on the palm, just like it was dead! 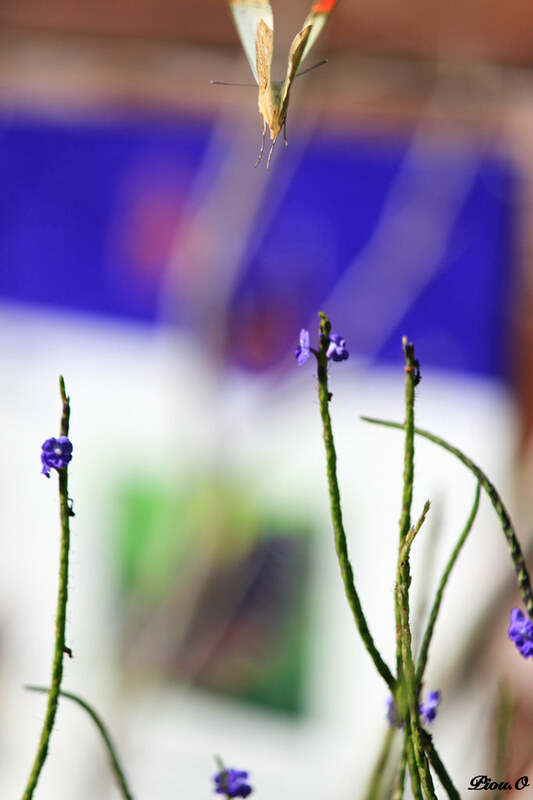 Soon while we were still wandering whether it’s dead, it flapped the purple wings and flew away. 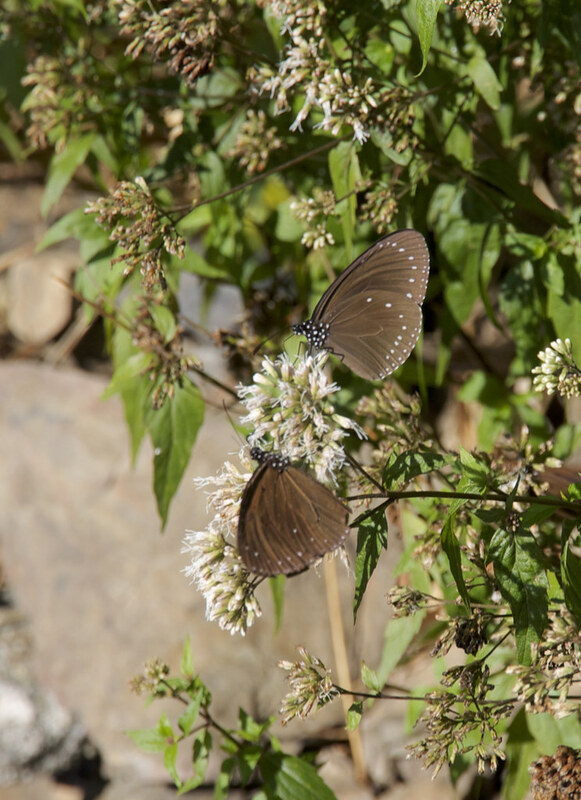 “This Euploeini butterflies will flap their purple wings, across the mountain and valley back north to their breeding ground, highway will be shut for their travel route" says the guide. "Every March, you will see a cluster of butterflies, like massive dark clouds moving fast across your head, that’s impressive" I imagined the scenery in my head, couldn’t believe we might have the chance to see such migration in Taiwan, I memorized the period of their migration, end of March, and add it to my schedule book next year. Every Dec. to Mar. next year, there will be bus to Moalin for Butterfly tour, check the site get more info. Every Dec. to Mar. 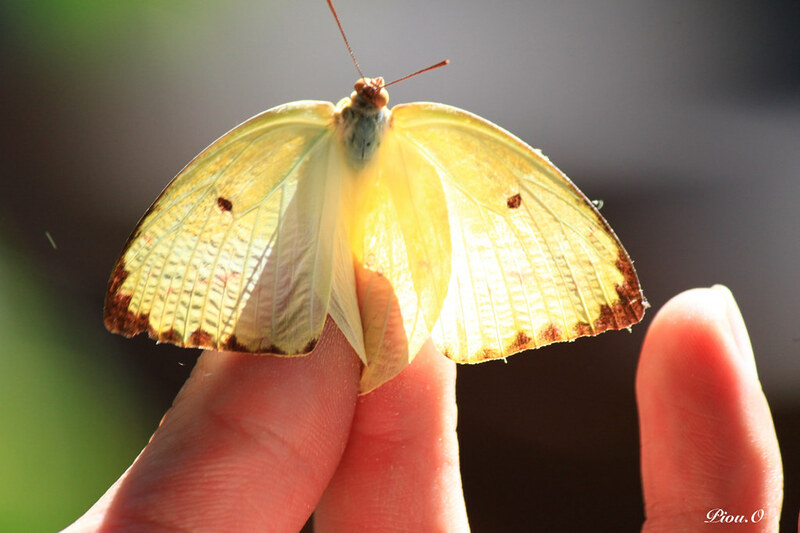 next year, butterflies go out for nectar plants around 9:00 a.m., and go back home at 15:00. The best whether to watch the butterflies: sunshine, no wind. You might want to plan a trip with traditional aboriginal ceremony together, check out this site. 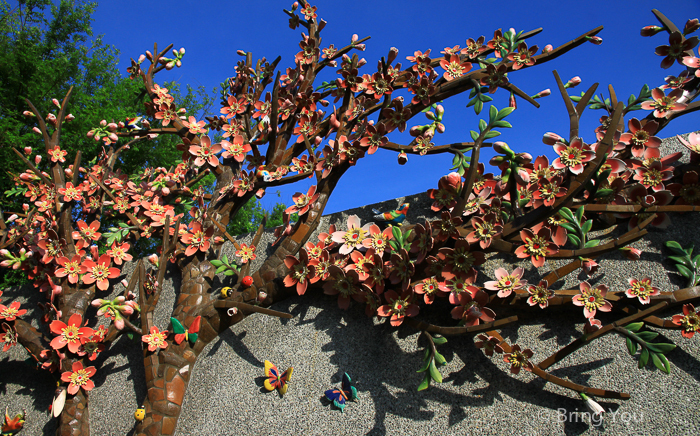 Ecological, Taiwan Story butterfly. permalink.